Dursley is well known for the masses and masses of pink and white cyclamen that literally carpet the ground under the century old oak and fir trees. The ground conditions are perfect for them to have naturalised over the last 100 years. Come out and have a look for yourself. Contact Judith if you would also like her to make you Devonshire Tea. She whips scones up while you are wandering the garden. 06 3724 804. January at Dursley features Lilies and Roses. They are found throughout the garden. Many of the lilies Judith has bred herself, so you will see all sorts of variations in the most beautiful layers of colour. Come for a visit any time - plenty of shade and plenty of seating. 1899 Te Ore Ore Bideford Road, Masterton. Rhododendrons everywhere, roses just starting, late season daffodils, and all sorts of little treasures to come and look at. The garden looks fabulous. Come on out. 1899 Te Ore Ore Bideford Rd, Masterton. The trees are in full bloom at the moment. 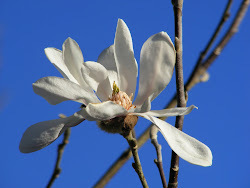 Many young magnolias are in flower. Prunus just starting. Bulbs going strong - Sparaxias particularly stunning in many parts of the garden. And the tulips! Thousands of tulips. Come out and have a wander around on these gorgeous spring days. 1899 Te Ore Ore Bideford Rd. Dursley is a large country garden surrounding a family home, and is open to the public. The owner and 'Head Gardener' is Judith Callaghan. Judith welcomes garden visitors through-out the year, as the garden changes significantly from season to season. The large nature of the garden means there are expansive plantings of various plants featuring at any one time - from roses, and perennials in summer, to daffodils, tulips and hellebores in winter and spring. Visit the pages below for more detail, and to see some of the feature plantings at Dursley. All photographs have been taken by Rachel Callaghan unless otherwise specified.